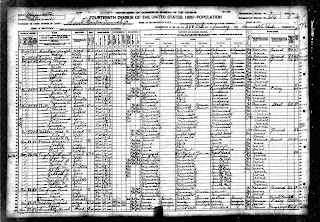 1895 Minnesota Census, Hartford Township, Todd County, Minnesota, Roll V290_100. Theresa's father, Fredrick Dinkel, was 41 years old. He was born in Prussia. 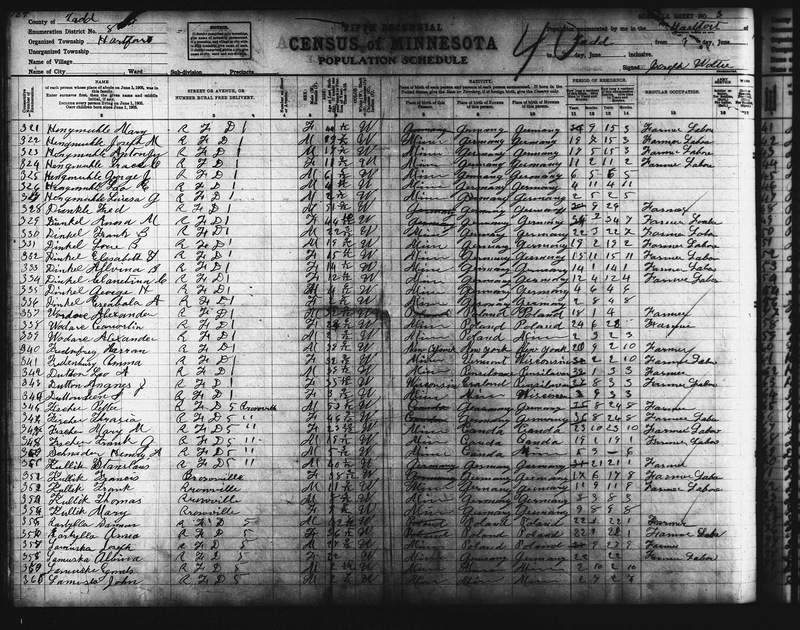 Fred had been a resident of Minnesota for 19 years and 7 months and he had been a resident of the enumeration district for 16 years and 2 months. He was a farmer by trade and was employed all 12 months of the year. Both of his parents were of foreign birth. Theresa's mother, Anna M. Dinkel, was 34 years old. She was born in Illinois. Both of her parents were of foreign birth. Theresa's brother, John B. Dinkel, was 13 years old. He was born in Minnesota. Theresa's brother, Frank B. Dinkel, was 12 years old and was born in Minnesota. Theresa's sister, Lena Dinkel, was 10 years old and was born in Minnesota. Theresa's brother, Louis P. Dinkel, was 9 years old and was born in Minnesota. Tracy E. Dinkel (Theresa) was 5 years old and was born in Minnesota. Theresa's three younger sisters, Minnie B. Dinkel (4 years old), Clementine Dinkel (2 years old), and Mary (1 month), were all born in Minnesota. 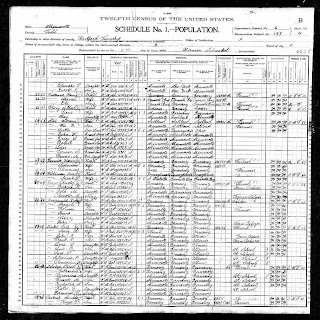 1900 U.S. Federal Census, Hartford, Todd County, Minnesota, Roll: T623_794; Page: 4B; Enumeration District: 193. 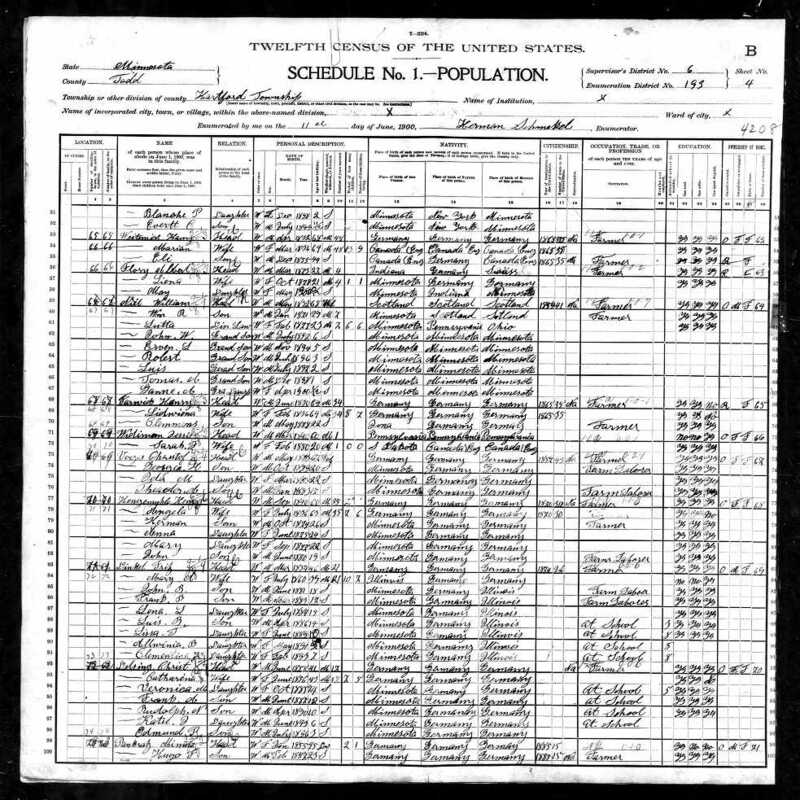 Theresa's father, Fritz, was born March 1854 (46 years) in Germany, which was also the birthplace of both of his parents. He was a white male and had immigrated to America in 1874. Fritz was a farmer by trade and he owned his morgaged farm. He could read, write, and speak English. He had married his wife, Mary in 1879. Mary A. Dinkel, Theresa's mother, was born July 1860 (39 years) in Illinois. Her parents had been born in Germany. She was a white female who had given birth to 10 children, 7 of which were still living. She was not able to read or write English, but she did speak English. 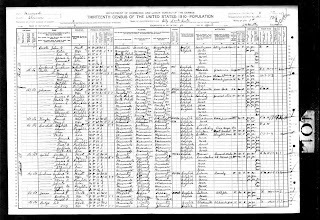 John B. Dinkel was born June 1881 (18 years) in Minnesota, he worked on his fathers farm. He could read, write, and speak English. Frank B. Dinkel was born March 1887 (17 years) in Minnesota. He also worked on his father's farm. He could read, write, and speak English. 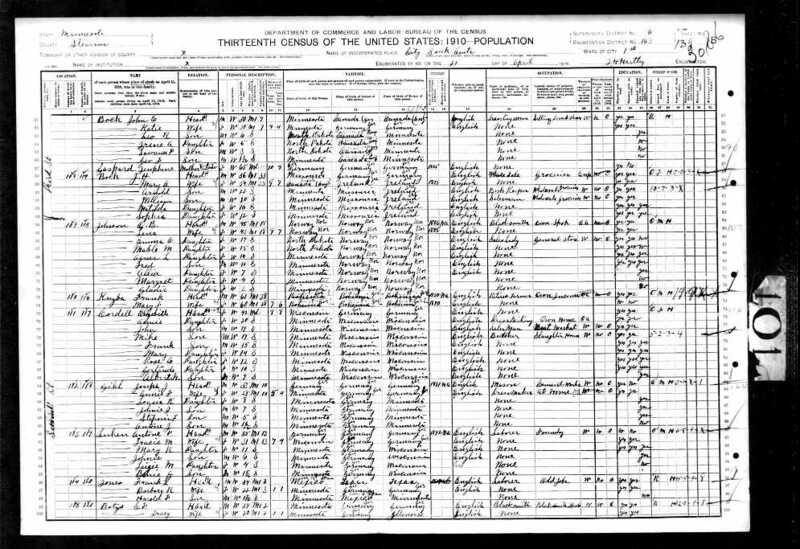 Lena L. Dinkel was born July 1884 (15 years) in Minnesota. She could read, write, and speak English. Luis B. Dinkel was born April 1886 (14 years) in Minnesota. He attended school and could read, write, and speak English. 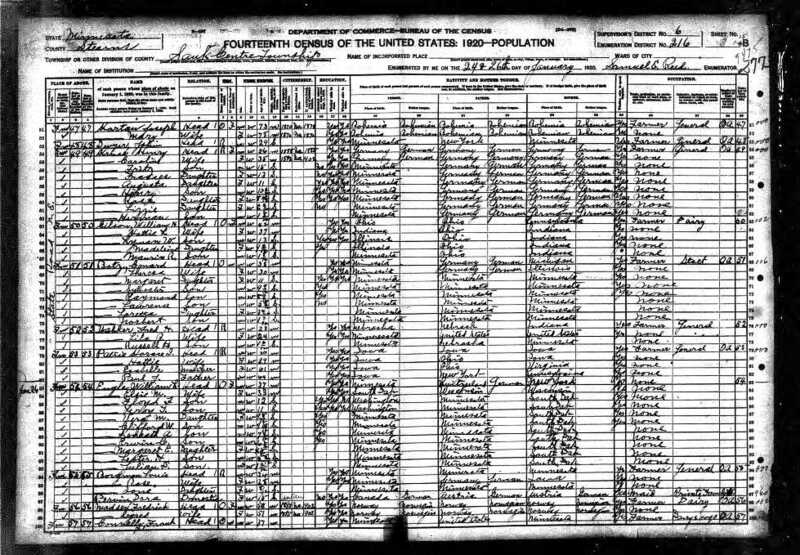 Lizza T. Dinkel (Theresa) was born June 1889 (10 years) in Minnesota. She was attending school and could read, write, and speak English. Allvinia B. Dinkel was born May 1891 (10 years) in Minnesota. She was attending school. Clementina K. Dinkel was born February 1897 (7 years) in Minnesota. She was attending school. 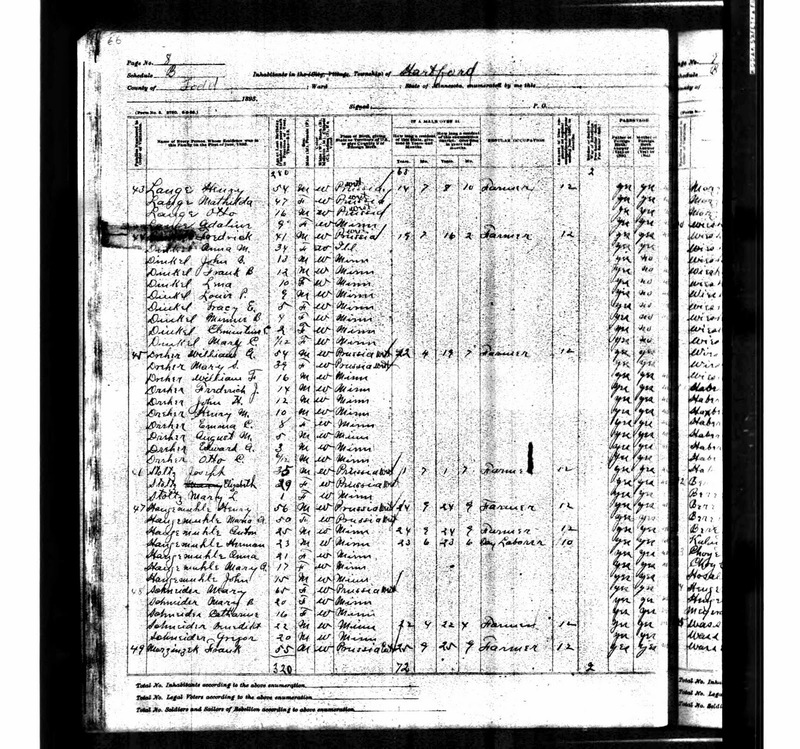 1905 Minnesota State Census, Hartford Township, Todd County, Minnesota, page 134, line number 332, film number 928819, image 00214. Taken 7 June 1905. Fred Dinkel and his family all lived on RFD 1. He was 51 3/12 years old and gave his birthplace as Germany. Both of his parents were born in Germany as well. 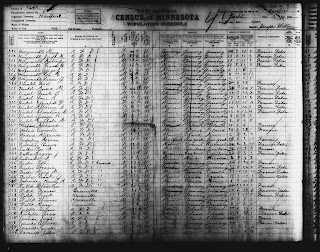 He had lived in Minnesota for 30 years and had lived in this enumeration district for 26 years. Fred was a farmer. Anna M. Dinkel was 44 10/12 years old. She listed that she was born in Germany, as was both of her parents. She had been living in Minnesota for 34 years and 7 months. She had been living in the enumeration district the same length of time. She worked on the farm. Frank B. Dinkel was 22 3/12 years old. He was born in Minnesota and had lived in Minnesota and the enumeration district his entire life. He was a farm laborer. Louis B. Dinkel was 19 2/12 years old. He was born in Minnesota and had lived in Minnesota and the enumeration district his entire life. He was also a farm laborer. Elisabeth T. Dinkel was 15 11/12 years old. She was born in Minnesota and had lived her entire life there. She was a farm laborer. Allvina B. Dinkel was 14 1/12 years old. She was born in Minnesota and had lived her entire life there. She was a farm laborer. Clementine Dinkel was 12 4/12 years old. She was born in Minnesota and had lived her entire life there. She also worked on the farm. George H. Dinkel﻿ was 4 6/12 years old. He was born in Minnesota and lived there his whole life. Isabella was 2 8/12 years old. She was born in Minnesota and lived there her whole life. 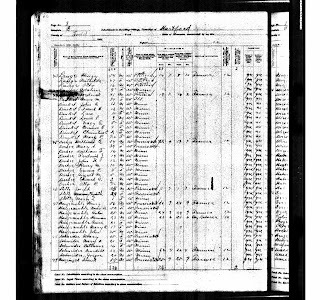 1910 U.S. Census, Sauk Centre Ward 1, Stearns County, Minnesota, Roll T624_727, Page 13B, ED 0163, Image 446, Family 121. C. F. Botz (Conrad) was 29 years old. He had been married for 2 years. He was born in Minnesota. Both of his parents were born in Germany. He spoke English and was a Blacksmith by trade. He was working of his own accord and was employed the entire year. He was able to both read and write. He rented his home. Tracy (Theresa) Botz was 20 years old. She had given birth to 1 child, which was still living. She was born in Minnesota, her father was born in Germany, and her mother was born in Illinois. She spoke English and was unemployed. She could read and write. Margaret L. Botz was 1 6/12 years old. She was born in Minnesota. Conrad Botz, 38 years old, owned his own home. He was able to read and write. Conrad was born in Minnesota and spoke English. His father was born in Germany and spoke German, his mother was born in Michigan. He was a stock farmer and was employed on his own accord. Theresa Dinkel, 30 years old, was able to read and write. She was born in Minnesota and spoke English. Her father was born in Germany and spoke German, her mother was born in Illinois. She was unemployed. Margaret, 11 years old, attended school. She was able to read, write, and speak English. She was born in Minnesota and was unemployed. Sylvester, 9 9/12 years old, attended school. He was born in Minnesota, spoke English, and was unemployed. Raymond, 8 7/12 years old, attended school. He was born in Minnesota, spoke English and was unemployed. Lawrence, 5 3/12 years old, was not attending school. He was born in Minnesota. Loretta, 3 6/12 years old, was not attending school. She was born in Minnesota. Norbert, 1 7/12 years old, was not attending school. He was born in Minnesota. Conrad Botz 49 years old, owned his own home. His family lives on a farm and did not own a radio set. He was 28 when he married Theresa. He was not attending school, but could read and write. He was born in Minnesota, his father born in Germany, and his mother was born in Michigan. He was a general farmer by occupation and was working on his own account. He was not a veteran. Theresa Botz was 40 years old and was born in Minnesota. She was 19 when she married Conrad. She was not attending school, but could read and write. Both of her parents are listed as having been born in Minnesota as well. She was unemployed. Sylvester Botz was 20 years old and was born in Minnesota. He was attending school and could read and write. He was able to speak English and was a general laborer by trade, and worked for wages. Raymond Botz was 19 years old and was born in Minnesota. He was not attending school and could read and write. He spoke English and was a store clerk by trade. He worked for wages. Lawrence Botz was 16 years old and was born in Minnesota. He was attending school and could read and write. He could speak English and was unemployed. Loretta Botz was 14 years old and was born in Minnesota. She was attending school and could read and write. She could speak English and was unemployed. Norbert Botz was 12 years old and was born in Minnesota. He was attending school and could read and write. He could speak English and was unemployed. Ruth Botz was 10 years old and was born in Minnesota. She was attending school and could read and write. She could speak English and was unemployed. Conrad Botz was 8 years old and was born in Minnesota. He was attending school. Richard Botz was 5 years old and was born in Minnesota.